It is no news a lot of doctors like to stick up a rather snotty nose to EMR. The defenders of the EMR tend to label such doctors as archetypal Luddites, sticking to their archaic ways and unbecoming of change and the new times. But as is usually the case with any two heated but opposite arguments, the truth likely lies somewhere between the two extremes. On an objective basis, there is no denying that automatisation of medical record keeping is the new way forward. In theory, if the machine could keep records for you and give it back to you when and where you want it, thus freeing up valuable time for the patient encounter, that should be winsome for everyone. That alas, is a vision of the EMR utopia, and let alone being anywhere close to such utopia, it is difficult to ascertain if we are even set in the road leading us there. Right there, I think is where EMR loses a lot of ground against paper records. At any practice, time is the most valuable resource, and anything that doesn’t offer a straight off benefit to save time will have a hard time being adapted. Add to that the inertia people have about their old ways and you have a deal breaker right there. That’s not all. Driven by the constant government whip to adopt EMR, and an EMR industry that is hell bent upon imposing itself on healthcare, a lot of makeshift EMR adoption has taken place. So you have hospitals where one part is using one system while the other is using a completely different one. At one clinic I recently worked at, we had to switch between 3 different EMR systems, just to get the patients records. And there still was the paper records not to mention the dictation.The constant juggling not only made the patient encounters time consuming and cumbersome, it literally made us curse at the computers and ruin an otherwise perfectly normal day at work. Patient volumes have gone down from 15-16 patients per day to a half of that after EMR adoption. 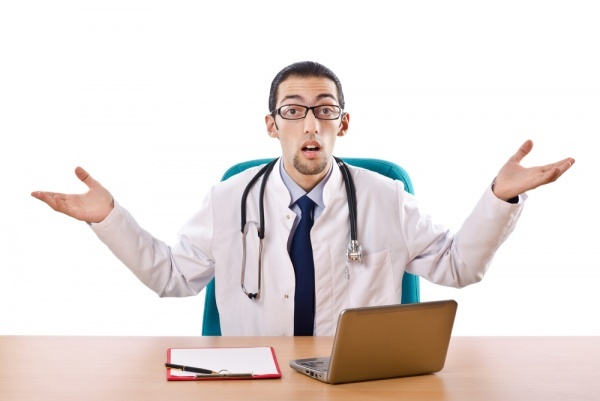 What’s wrong with the current adoption of EMR? Why are even the converted like me questioning EMR? I think there are two reasons for such seemingly epic failure. First, how we interface with an EMR. Second how the EMR tries to impose its will on to us instead of the other way around. A keyboard and a point and click device may well have worked for many other interactions with the computer, but with an EMR it doesn’t always appear to be nifty. It is a common experience that most people find dictating their notes much faster than typing them. Accurate automated transcribers could really speed up record keeping, thereby selling EMR to the unconverted while saving costs over manual transcription. On the same note, no EMR is going to be see a faster adoption if something like writing a prescription takes a minute when in paper it barely takes 10 seconds. Right now doing something as simple as writing a prescription feels like running through a bunch of fire breathing hoops. Someone may argue, you can at least read it better, but don’t get me started on how the EMR can come up with its own ludicrous set of errors, something that would never be possible with paper. Trying to impose a ready made architecture on to health care will not work. “It works for retail and banking,” some people seem to offer cluelessly. But a patient encounter is no visit to your bank cashier. And human body is not your bank account, it is way more complicated and it is bound to generate way more complex information that is difficult to straight jacket into the rigid and rudimentary pipeline of set information pathways. An ideal EMR is supposed to be a seamless body-glove; today they feel like the hangman’s cloak, not only are they cumbersome, dark and dreary and suffocating, under their apparition, they force things you to do things you wouldn’t otherwise do. Such forced behavior modification may make the administrator, the insurance company, and the government happy but I can’t understand how selecting a dozen pesky radio buttons while doing the discharge makes the patient lead a healthy life or make his doctor particularly enamored with the EMR, just because the government said so, or that it made the IT companies a few million dollars richer. Kiran Raj Pandey is an internal medicine resident who blogs at page59.